Movie Ratings have always been an issue of debate. Opinions for movies differ with many factors making 5-or-10 scaling method not perfectly reliable. 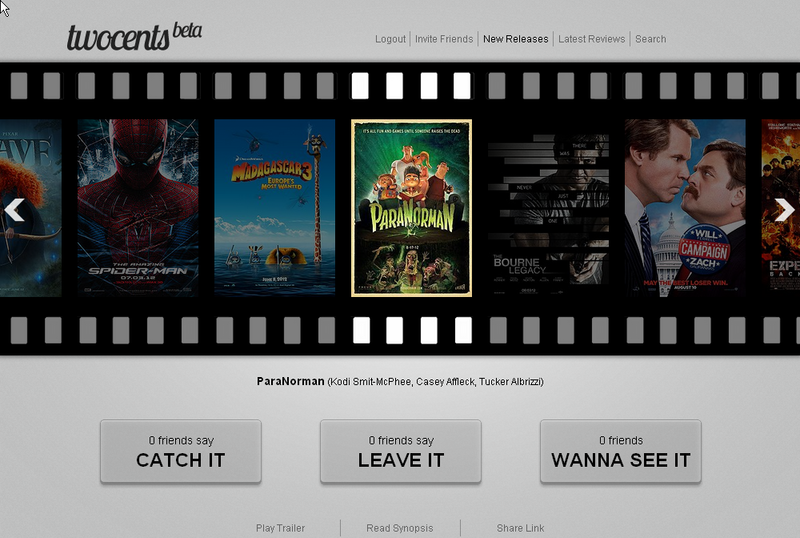 To solve these drawbacks of de-facto movie rating system, Raveesh Bhalla and Shashank Nayak have come up with a movie review and recommendation site twocents which focusses on user’s social circle. Nice Idea. Let’s have a look. Twocents suggests social media integration for better experience, so I signed in with my Facebook account. The landing page seemed perfect. Nice design. So when you select a movie you have can give three predefined responses viz. Catch It, Leave It, and Wanna See It. It also gives details about the movie such as trailors snd synopsis. Next, I tried searching for some movies and was able to find those movie. However I expect search to be more advanced as didn’t worked few times. Also I may not always know the exact name of the movie. However, being in Beta, I think this will be advanced in final versions. The database of movie with which they have started is large. So here is the wrap up. Twocents seems to be a nice idea. Cool interface. Social Integration and analysis is the main interesting part. Once you have your friend circles on twocents, this is surely going to be helpful in deciding how you choose on your movies. Also, mobile apps which twocents is soon going to roll out will make this easily accessible on mobiles. However it presently needs growing users so that the recommendation and rating part becomes effective. Waiting for final version to roll out soon.